This species is accepted, and its native range is W. Cuba (incl. Island de la Juventud). Nativa en Colombia; Alt. 0 - 2550 m.; Andes, Llanura del Caribe, Pacífico. A shrub up to 1.5 m. tall. Leaf-blade oblanceolate-subpanduriform, 6–11(–13.5) cm. long, (1.5–)2.5–4(–6) cm. wide, acutely cuspidate-acuminate, attenuate, entire except at the base, which is usually glandular-denticulate, 3(–5)-nerved from the base, with up to 12 pairs of lateral nerves, glabrous above and beneath; petiole 1–2(–3) cm. long, glabrous. Stipules filiform, 1 mm. long. Inflorescences apparently terminal or axillary, subcorymbiform, up to 14 cm. long, on a clear scape up to 10 cm. 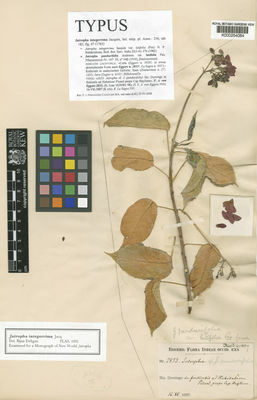 long; axis glabrous; bracts linear-lanceolate, 2–10(–15) mm. long, subentire. Male flowers:calyx-lobes triangular, 1 mm. long, 1 mm. wide at the base, subacute or obtuse, entire, glabrous; petals oblanceolate, 1.1–1.3 cm. long, 4–5 mm. wide, rounded at the apex, glabrous, but pubescent within at the base, scarlet or pinkish; disc-glands free, flattened, rounded; stamens 10, the 5 outer with the filaments 2.5 mm. long and united for three-quarters their length, the 5 inner with the filaments 5 mm. long and united for two-thirds their length, anthers linear, 1 mm. long. Female flowers:calyx, corolla and disc as in ♂; ovary ± conical, 2 mm. long, 1.5 mm. diameter at the base, glabrous; styles united at the base, 3 mm. long, stigmas deeply bifid. Male flowers:calyx-lobes triangular, 1 mm. long, 1 mm. wide at the base, subacute or obtuse, entire, glabrous; petals oblanceolate, 1.1–1.3 cm. long, 4–5 mm. wide, rounded at the apex, glabrous, but pubescent within at the base, scarlet or pinkish; disc-glands free, flattened, rounded; stamens 10, the 5 outer with the filaments 2.5 mm. long and united for three-quarters their length, the 5 inner with the filaments 5 mm. long and united for two-thirds their length, anthers linear, 1 mm. long. Female flowers:calyx, corolla and disc as in ♂; ovary ± conical, 2 mm. long, 1.5 mm. diameter at the base, glabrous; styles united at the base, 3 mm. long, stigmas deeply bifid. Fruit rounded-trigonous, ± 1 cm. long and 1 cm. diameter, smooth, dehiscing both septicidally and loculicidally. Seeds ellipsoid-ovoid, 8–9 mm. long, 5 mm. wide, brownish buff, flecked and mottled with blackish brown, dull or slightly shiny, with a bifid caruncle 2 mm. wide. Bangladesh, Belize, Colombia, Costa Rica, Dominican Republic, Florida, Guatemala, Haiti, Honduras, India, Jawa, Leeward Is., Marquesas, Nicaragua, Panamá, Peru, Philippines, Puerto Rico, Society Is., Southwest Caribbean, Sulawesi, Trinidad-Tobago, Venezuela, Venezuelan Antilles, Windward Is. Dehgan, B. (2012). Flora Neotropica, Monograph 110: 1-273. Pax in A. Engler, Das Pflanzenreich IV. 147(1): 50 (1910). Jacq., Select. Stirp. Amer. Hist. : 256, t. 183, fig. 47 (1763).